Ivan is responsible for the Product Marketing of Device Connectors in Phoenix Contact South East Asia. Missed the first article in this two part series? Read it here! As the number of participants in the field increases, so does the need to network them using information technology, equip them with appropriate electronics and interfaces for signal, data and power transmission, and shield them from harsh environmental conditions. Electromechanical interfaces play an important role here: they are the key to exploiting further miniaturization potential and making devices more reliable and flexible in industrial applications. However, dirt, vibrations, high temperatures and electromagnetic radiation place high demands on passive components. Phoenix Contact responds to these requirements with a newly developed series of board-to-board connectors with 0.8 and 1.27 mm pitch. 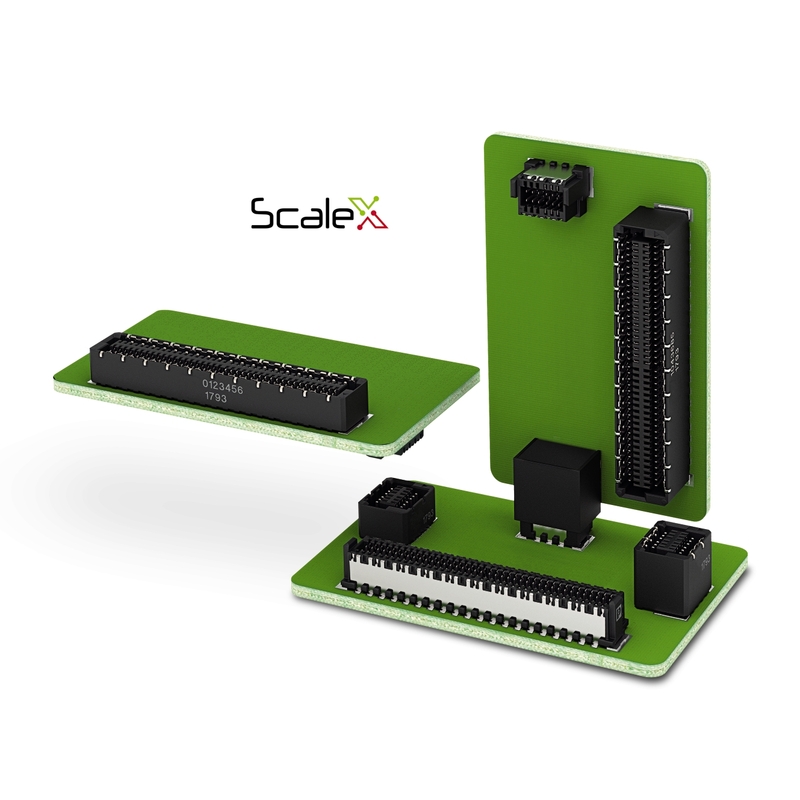 Both product families are ideally suited for the device-internal connection of several printed circuit boards. Thanks to horizontal and vertical variants, device manufacturers can implement mezzanine, orthogonal or coplanar PCB arrangements and thus offer flexible electronic layouts for different device applications. All board-to-board connectors are designed for currents up to 1.4 A and voltages up to 500 VAC; and they offer solutions for 12 to 80 connection poles. Reverse polarity protection is particularly important in the compact pitches to prevent damage to the contact metals when they are mated and to ensure long-term stable connections inside the device. All board-to-board connectors are therefore polarized accordingly – the special geometry of the insulating housing reliably prevents female and male connectors from being mismatched. The double-sided contacts of both product families make contact on the gold-plated rolled surfaces of the metals and thus guarantee an optimum contact force at all times, even under high shock effects of up to 50 g. Another advantage of the robust design: up to 500 mating and withdrawal cycles are possible without impairing electromechanical stability. ScaleX contact system: The double-sided contacts provide high stability and allow up to 500 insertion and withdrawal cycles. The unshielded Finepitch 1.27 series is suitable for stacking heights from 8 to 13.8 mm and, thanks to pre-assembled female connectors with flat ribbon cable, also enables wire-to-board applications, for example for larger PCB spacings. The Finepitch 0.8 mm series offers particularly compact solutions for high-speed data transmission at up to 16 Gbps. Depending on the application and the required degree of protection, unshielded versions and versions with lateral shielding metals are available for maximum data integrity. Mechanically robust thanks to ScaleX technology. The hermaphroditically designed contacts of the more compact product series allow stacking heights from 6 to 12 mm. The newly developed ScaleX contact system not only guarantees particularly high mechanical stability. It also permits high tolerances for male and female connectors positioned differently for production or assembly reasons. The catch range of the Finepitch 0.8 series is ±0.7 mm per axis, the angle tolerances for mating are up to ±4 degree in longitudinal direction and ±2 degree in transverse direction. These high tolerances compensate the mechanical offset between the printed circuit boards. 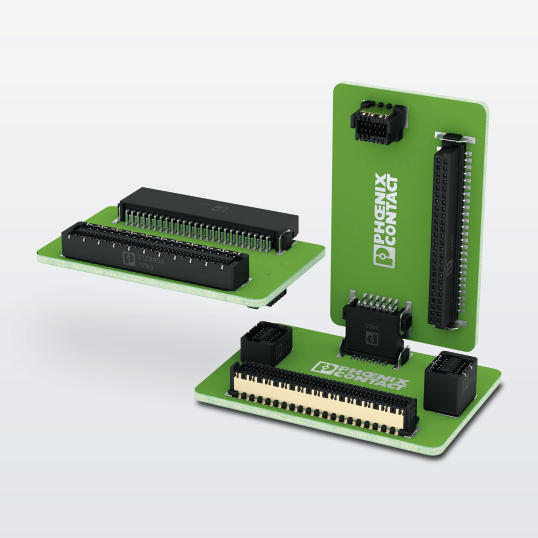 The new board-to-board connectors of the Finepitch series are ideally suited for integration into the fully automated SMT process. 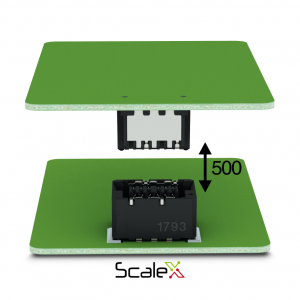 Specially shaped and tin-plated gullwing surfaces offer a high contact area on the solder pads and thus improve the mechanical stability between the connector and the PCB surface. The soldering surfaces are designed in such a way that they still allow “overhead” soldering. This is always necessary when the printed circuit board is assembled on both sides. The unshielded versions also permit automatic optical inspection (AOI) and are delivered in a taped package for the appropriate process. 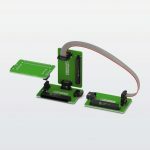 Board-to-board connectors of the Finepitch 0.8 mm and 1.27 mm series offer ideal solutions for the flexible connection of several printed circuit boards in industrial electronic devices. The particularly robust contact systems allow different PCB arrangements and stacking heights and thus support flexible and modular device designs. Phoenix Contact is thus following the trend towards miniaturization and modularization of intelligence in the field. The great advantage for device manufacturers is that they can obtain tested and reliable device interfaces for the transmission of signals, data and power from a single source and can thus offer highly adaptive devices for the intelligent factory – regardless of the location and local market conditions. In the past five years, hardly any other buzzword has driven the industrial production and automation sector like “the intelligent factory”. Otherwise diverse markets as the USA, Europe and China agree on the implications: Industrial production must become more networked, more efficient, more intelligent and thus more internationally competitive. Robust board-to-board connectors are an important step along this path. One of the drivers of a increased competitiveness should be enhanced versions of production resources that lead to higher performance, more flexible production lines and lower manufacturing costs. For the year 2020, various analyses forecast almost 20 billion (IDC, 2016), almost 30 billion (Gartner, 2017) or even up to 50 billion (CISCO IBSG, 2011) IT-networked “things”. Even the most cautious forecast means that in just two years there will be almost three times more things communicating with each other than people. In addition to the ubiquitous smart devices, these things also include the intelligent devices of the industrial production: controllers, power supplies, I/Os, HMIs and many more. These devices themselves have become more intelligent in recent years. Their electronic components, such as processors, could be produced at substantially lower cost and thus became more powerful and numerous. Together with their components, industrial electronic devices themselves became ever smaller, more powerful and more numerous. As a result, more intelligence from a formerly central and strictly hierarchical unit moved decentrally into the field. Stay tuned to our blog for the second part of this article! “Smart factory” describes a production environment whereby the equipment and machinery are able to improve processes through automation & self-optimization. It is a combination of efficient production, information, and network communication, with the potential for integration across the entire manufacturing supply chain. This demands making devices which are more reliable and flexible, yet they need to overcome high temperatures, electronic magnetic interference, and vibration, as well as be shielded from harsh environment conditions. Electromechanical interfaces are the key to handle further miniaturization potential and making devices more reliable and flexible in industrial applications. EH stands for “Efficiency Housing”. Designed to protect electronic parts in the environment of the application by means of a suitable “packaging”, the EH enables the fast and uncomplicated installation of the printed circuit board. We offer several varied designs of the housing systems for cabinet-type enclosures, suitable for fast and cost-effective PCB mounting whereby the printed circuit board is accessible from the front of the control cabinet when installed in the housing. With regards to the digital era, online configuration plays an important role. In just a few steps, you can customize the desired EH housing from the Phoenix Contact website. The online configurator offers a user-friendly configuration of all individual components with drag-and-drop functionality – also available on mobile devices with iOS and Android operating systems. The desired housing size and colour can be selected and the appropriate connection technology can be added. After the desired family of housings is selected, the PCB connections that match the selected design are displayed. The individual components can then be exported as parts lists or transferred directly to the shopping cart and ordered. You are guided step by step through the configuration process. Your application is configured towards an optimal solution. Even the PCB can be configured, which is then provided as a 3D file layout for production. Selecting an enclosure is simplified by reviewing the sizes of the components & the PCB board that is to be enclosed, followed by the aesthetic look. However, when choosing an enclosure suitable for a harsh environment, the requirements become complex. Several things need to considered, such as how the enclosure is going to be mounted, whether the enclosure needs a vent, what is the degree of protection, what kind of test needs to be performed and many more. Making a wrong choice can be extremely destructive, brand damaging and it also signals the end of the product. Phoenix Contact presents new housings for electronics, for especially harsh ambient conditions. The robust housings of the Environment Case System (ECS) series with IP69 degree of protection are suited for a broad temperature range of -40°C to +100°C, and reliably protect the integrated electronics from physical influences. Vented or Unvented Enclosures Using the vented version allows pressure to escape to reduce the stress on the seal and also allows any condensation built up to escape, protecting the valued electronics inside the enclosure. Tamper Protection Allows manufacturers or installers to add tamper evidence security in the latch areas to tell if anyone has opened the product in the end application. Customers are able to choose which thickness they want to use for their PCB design. Pole Mounting (Accessory) Using our pole mount accessories the customer can easily mount their device on a pole (mast) or frame. PCB Lock Integrating this accessory allows technicians to only pull the PCB out of the enclosure to a set length. It can also prevent the PCB and faceplate from falling out of the enclosure when unlatching. Application specific and miniaturized connectors have come on rapidly. Fueling this rapid change is a combination of advances in technology. The control cabinets are getting smaller. This in turn reduces the available space for the devices and their boards. In addition, the functional density of devices is steadily increasing. Thus, PCB connectors must also be based on the new size specifications. 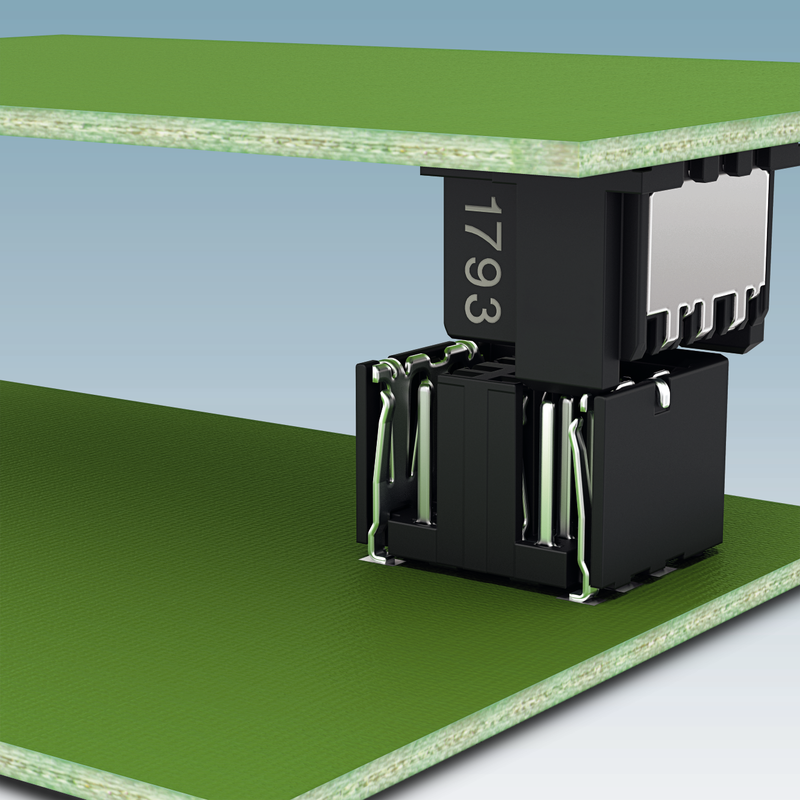 Phoenix Contact has launched two new 2.54 mm printed circuit board connectors: the FMC 0.5 and DFMC 0.5 connectors. It is designed to meet the miniature & quick connection requirement, boasting a compact plastic housing and push-in spring connection. The direct connection is possible for solid and flexible conductors with or without wire end ferrules. The wiring can be easily released without the aid of a screwdriver and the connectors can hold conductors with cross sections from 0.14 to 0.5 mm². Figure 1. Low height profile – the FMC 0.5 connector family offers a push-in spring connection with spring opener. This connector makes it ideal for designers who face the challenge of keeping up with the trend towards miniaturization. 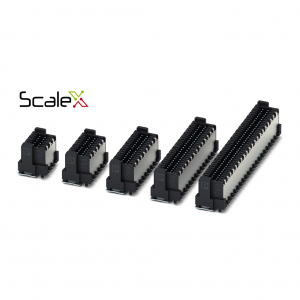 The FMC 0.5 connector is a single-row connector with a height of only 5.4 mm whereas the DFMC 0.5 connector is a double-row connector with a low height of only 10.5 mm. Plugs in the same grid with push-in spring connection and spring openers that were previously available on the market were twice as high. Both connectors follow the trend of miniaturization – and the associated trend towards a high contact density in a small space. It is designed for automated soldering processes (SMD and THR soldering processes). The two product families’ pin headers are made of LCP (liquid crystal polymer) plastic to withstand the high temperatures in the convection oven. The applications for the two new connectors are extremely versatile. Possible target groups include measurement and control technology, automation technology and energy technology. Conceivable applications include controllers and inverters. The focus of the application areas is on industrial applications where signals are transmitted to the PCB. The new FMC 0.5 and DFMC 0.5 plug connectors and the associated pin headers from Phoenix Contact meet the market requirements in the field of printed circuit board connection technology. Device manufacturers now get powerful connectors that require little space on the circuit board and in the device. For the end customer, the connectors also provide a quick, easy and convenient connection option. Processing in highly automated SMD processes is not a problem, and a gold-plated contact system provides additional security for the transmission of signals in industrial environments. If you would like a sample board, or would like to know more, don’t hesitate to contact me via the form below! What is considered important when it comes to choosing the right PCB enclosure. Let us guide you through the process. Price? Style? Service & support? Reputation of the supplier? In the matter of fact, all of above are essential. The engineers should select the enclosure at first and then choice the mechanical & electronic components to suit the enclosure. The 3 common plastic enclosures are ABS, Polycarbonate, Polyester which are high functionality, light weight, flexible in design. The ingress protection classification DIN EN 60529 determines and rates protection against solid particle (e.g. dust) as well as liquid incursion. How the enclosure will last over many years of operation depends on how well you evaluate the environmental impact of elements such as UV rays, temperature, airborne debris, etc. Different materials offer varying degrees of impact resistance. The internal and external dimensions of a PCB enclosure is extremely important. Sadly, in many cases, the PCB is chosen first and this makes it difficult for the engineer to source the best fit enclosure solution. The enclosure supplier may need to support modifications with value-added services that include drilling, milling, printing, color, etc. Some suppliers can even provide advance services like fitting membrane keypads, displays on the enclosure, etc as a complete solution. A complex PCB design may make it difficult to assemble electronic and mechanical components in the enclosure, which make is an important point to consider when selecting an enclosure. We, at Phoenix Contact, understand your problems and offer a wide range of options for shape, color, and function when it comes to choosing the right enclosure. Whether on a wall or on a DIN rail, from light gray to sky blue, narrow or wide, many many to choose from. With the two new enclosures, Universal case system (UCS) and Environment case system (ECS) added into the selection, it is much easier to choose your enclosure. Please view the Enclosure brochure. Do you know one common challenge for devices used in areas such as filter and inductor construction, energy distribution and power supply production is Electrical Safety i.e. how to lead the high power through the panel wall safety. Finding the right wall feed-through terminal block to address electrical safety is a challenge as there are not many suitable solutions for high current and large wire cross-section. It is also unlikely that the manufacturers will choose the feed-through terminal blocks as early as the design stage. This often leads to manufacturers designing their customized solutions out of sheer necessity; thus resulting in problems such as maintaining touch protection or insulating the current bar from the device housing. The device manufacturers may also face problem obtaining the necessary certification for their devices. If the device is to be used worldwide, IEC 61800-5-1 and UL 1059 certifications are required. Many solutions in the market are unfortunately not adequately certified. Phoenix Contact offers an extensive range of high-current feed-through terminal blocks for various applications. You can find both pluggable feed-through terminal blocks and feed-through terminal blocks for permanent connections. The pluggable feed-through terminal blocks permit quick replacement and are thus service-friendly. In addition, the conductors can be preassembled. However, feed-through terminal blocks for permanent connections are more economical. Do you know Phoenix Contact has been providing these feed-through terminal blocks for almost three decades? Device manufacturers can choose the connection option to fit the application: fast push-in connectors, T-lox, conventional screw connectors, or simple bolt connectors. The connection areas range from 4 to 150 mm2 and the current-carrying capacity is up to 309 A. These connectors come in standard and moulded designs, either with horizontal or vertical connection directions. The moulded version ensures high leakage resistance, even when a small amount of moulding compound is used. The product range provides various connection options for space-saving connections in all installation locations. This means that device manufacturers can flexibly select the connection type, direction, and cross section. Specific solutions often require very specific housing designs. The concept for the new universal electronics housing (UCS) from Phoenix Contact makes it easy for equipment manufacturers to source for suitable packaging for their embedded system. Trends such as industry 4.0, Internet of Things, LTE (Long Term Evolution – 4th generation mobile communications) and Smart Home are increasingly utilizing the networking of electronics. The devices used are based on embedded systems. New application fields create a large number of electronic assemblies. Because of this, it is often difficult to find a suitable housing. With its flexible PCB mounting system, the new UCS by Phoenix Contact helps device manufacturers to implement the application quickly and hassle free. ‘Pick and Place’ Machine with THR components. Do not judge a connector’s cost-effectiveness just by its price. Its ability to improve the overall efficiency of the manufacturing process counts as well. This is where THR technology shines. The most common method of manufacturing a PCBA (Printed circuit board assembly) typically requires 2 process flows. Reflow soldering is used to mount the Integrated chip (IC) and passive components in the first process flow. This is then followed by a second flow utilizing wave soldering to mount the terminal blocks and connectors. The process can be optimized but that usually comes at a cost, e.g. installing a new machine. Hence, that eventually translates into a higher manufacturing cost in the short term. Is there a way to achieve higher efficiency in PCBA manufacturing without the accompanying costs? Higher efficiency at Lower Or No Cost? This is achieved by introducing connectors that are suited for the existing process line yet reduce the process flows to just one. This is made possible by the integration of Through Hole Reflow (THR) components in Surface-mount technology (SMT) installations, which dominate today’s assembly manufacturing process. The benefit of THR is to use the existing Surface-mount device (SMD) machines and remove the 2nd process, the wave soldering, thus reducing the manufacturing a complete PCBA into a single process. While it is the ideal situation to switch to an all-THR component solution, some components will still require wave soldering. Even so, there can still be a significant cost savings to make the switch. While there will not be a need to make changes to the existing equipment, some modifications will be required. For example it may require a change in the PCB design, an adjustment in the reflow profile, etc. These changes, however, will reduce the amount of man-hours required for wave soldering. Based on a typical PCBA consisting of 80% of ICs and 20% of terminal blocks & connectors, the switch could achieve up to 20% of cost savings as THR components fully supports ‘pick and place’ machines. If you would like to know more about Phoenix Contact’s THR connectors, just fill in the form and download a copy of our brochure. I would like to know more about THR Products from Phoenix Contact. Please contact me.